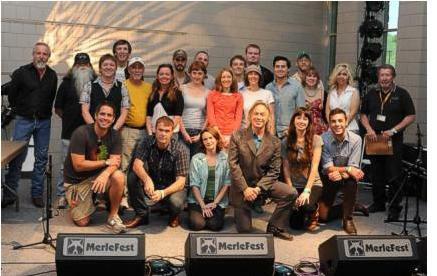 Wilkesboro, NC -- MerleFest 25, presented by Lowe's, is proud once again to host the Chris Austin Songwriting Contest. Now in its 20th year, the contest is an extraordinary opportunity for aspiring writers to have their original songs heard and judged by a panel of Nashville music industry professionals, under the direction of this year's volunteer contest chairperson, Grammy-winning singer/songwriter Jim Lauderdale. MerleFest 25 takes place from April 26-29, 2012. Contest entries for the Chris Austin Songwriting Contest (CASC) will be accepted beginning November 1 via two methods: U.S. Mail (P.O. Box 121855, Nashville, TN 37212) and Sonicbids (www.sonicbids.com/chrisaustinsongwritingcontest). The deadline for submissions is February 18, 2012. "The Chris Austin Songwriting Contest is an incredible opportunity for songwriters to get their works heard publicly and by professionals in the business," says Laurie Brintle, CASC coordinator. "We encourage all amateur songsmiths to take advantage of this contest. Don't miss this chance to compete at MerleFest 25 and be a part of this historic event!" The contest recognizes winners in four categories—country, bluegrass, gospel/inspirational and general. To be eligible to enter, a songwriter must not derive more than 50 percent of his or her total income from songwriting or music publishing. Details about entry fees, eligibility and other requirements are available at www.chrisaustinsongwritingcontest.org. Once submitted, songs are judged by a volunteer panel of Nashville songwriters, publishers and other music industry professionals. Judging is based on a song's originality, lyrics, melody and overall commercial potential. Twelve finalists, three from each category, will be announced during the first week of April 2012. Each of the twelve finalists will enjoy admission and lodging for three nights at MerleFest, will receive a mentoring session with Jim Lauderdale, and will compete on the Austin Stage at MerleFest 25. In addition, the first place winners will receive a performance slot on the Cabin Stage on Friday of the festival. Previous winners of the Chris Austin Songwriting Contest include Gillian Welch, Tift Merritt, Michael Reno Harrell, Adrienne Young, Martha Scanlan, David Via and Johnny Williams. Net proceeds from the Chris Austin Songwriting Contest support the Wilkes Community College Chris Austin Memorial Scholarship. Since its inception the scholarship has awarded over $35,000 to 73 deserving students. For additional information about the Chris Austin Songwriting Contest, call the contest hotline at 1-800-799-3838 or email Laurie Brintle, CASC coordinator at laurie.brintle@wilkescc.edu. Chris Austin, from Boone, North Carolina, worked as a sideman for Ricky Skaggs for three years, singing and playing guitar, banjo, mandolin and fiddle. During that time he was discovered by executives at Warner Bros. Nashville, who offered him a recording contract. While releasing singles including "Blues Stay Away From Me," "I Know There's a Heart in There Somewhere" and "Out of Step," Austin also developed his songwriting skills, as evidenced in "Same Ol' Love," recorded by Skaggs in 1991. On March 16, 1991, Austin's life was cut tragically short when the private plane carrying him and six other members of Reba McEntire's band, as well as her tour manager, crashed in the mountains near San Diego. Pete Fisher, then of Warnersongs and currently general manager of the Grand Ole Opry, and Kari Estrin, then MerleFest consultant and Pickin' for Merle video associate producer, initiated the songwriting contest to honor Austin's memory.